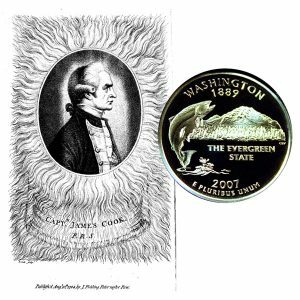 Today, the Washington State Quarter Coin remembers when Captain James Cook named Cape Flattery on March 22, 1778 during his exploration of the northern Pacific region. Cape Flattery, in Clallam County, at the southern entrance of the Strait of Juan de Fuca, the northwestern extremity of the state of Washington. One of Captain Cook’s crew was George Vancouver, who, in 1792, came to the same coast in command of an expedition. He sought to identify Captain Cook’s Cape Flattery, and finally placed it where it has since remained. Reference to the confusion of names has already been made under the item of Cape Alava. In the vicinity of the latter cape, government charts still show Flattery Rocks. Kellett, 1847, and other British charts show Cape Flattery in the place of Cape Alava, and the promontory now known as Cape Flattery is shown as Cape Classet. That name is supposed to be of Indian origin and is sometimes spelled Claaset or Klasset. Rev. Myron Eells is authority for the statement that Makah means “people who live on a point of land projecting into the sea,” and Klasset means the same thing in another Indian language. George Davidson says that in 1852 he found the head chief of the Makahs bearing the name of Clisseet. Captain Vancouver knew about the name of Cape Classet, but he concluded that Captain Cook intended the name of Cape Flattery for that place and so charted it. The Spanish name of “Cape Martinez” did not have much usage except on the Spanish charts. The wind continued at West, and North West; storms, moderate weather, and calms, succeeding each other by turns, till the morning of the 21st; when, after a few hours calm, a breeze sprung up at South West. This bringing with it fair weather, I steered North Easterly, in order to fall in with the land, beyond that part of it where we had already so unprofitably been tossed about for the last fort night. In the evening, the wind veered to the Westward. And, at eight o’clock, the next morning, we saw the land, extending from North East to East, nine leagues distant. At this time we were in the latitude of 47° 5′ North, and in the longitude of 235° 10′ East. I continued to stand to the North with a fine breeze at West, and West North West, till near seven o’clock in the evening, when I tacked to wait for daylight. At this time, we were in forty-eight fathoms water, and about four leagues from the land, which extended from North to South East half East, and a small, round hill, which had the appearance of being an island, bore North three quarters East, distant six or seven leagues, as I guessed. It appears to be of a tolerable height, and was but just to be seen from the deck. Between this island or rock, and the Northern extreme of the land, there appeared to be a small opening, which flattered us with the hopes of finding an harbor. These hopes lessened as we drew nearer; and, at last, we had some reason to think, that the opening was closed by low land. On this account I called the point of land to the North of it Cape Flattery. It lies in the latitude of 48° 15′ North, and in the longitude of 235° 3′ East. There is a round hill of a moderate height over it; and all the land upon this part of the coast is of a moderate and pretty equal height, well covered with wood, and had a very pleasant and fertile appearance. It is in this very latitude where we now were, that geographers have placed the pretended strait of Juan de Fuca. But we saw nothing like it; nor is there the least probability that ever any such thing existed. I flood off to the Southward till midnight, when I tacked, and steered to the North West, with a gentle breeze at South West, intending to stand in for the land as soon as daylight should appear. The Washington State Quarter Coin shows with an artist’s image of Captain James Cook, circa 1784.